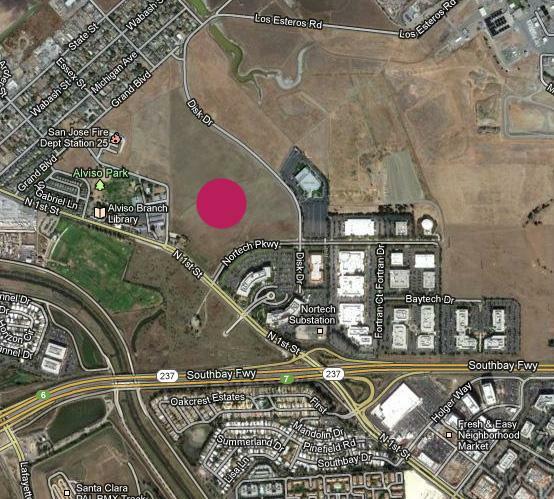 Cisco is parting with a 57 acre site that could house quite a large office development. In fact, it is already zoned for 650,000 SQFT of office or R&D space. Trammel Crow Co. is the purchaser and will either build this out as a speculative project or sell off pieces of the land to companies that are ready to build and have specific requirements in mind. The parcel is right at the border of Alviso and is very near the @First retail and hotel project anchored by Target and Fresh & Easy. Thousands of new apartments are also under construction right now in the general area. Unfortunately this is one part of North First not serviced by Lightrail, so transit here is not going to be great. I think it would be pretty neat if they could run something like a street car from the nearest station to @First, the new office developments, and the Alviso marina area. Cisco are doing the right thing by off-loading their unwanted land. They are also building a couple of multi-level parking lots behind some of their existing buildings along Tasman. That'll allow for more consolidation of workers and the good news is that it is in San Jose! I'd love to see something spectacular at this site. Likewise for the site across the street. However, I'm not holding my breath. I suspect it'll be pretty boring but you never know! Your suggestion about a street car is great...however a shuttle (like a Caltrain shuttle) is probably more cost-effective. That way, it could take in the Tasman LR station and the Great America Amtrak/ACE station. Let's see how this area pans out over the next year or so. You mentioned the apartments. There is also the new Aloft hotel and America Center and I believe there are 2 more buildings coming to America Center as well. They could also just increase frequencies on line 58 which serves this area and stops at Tasman. The Business Journal article kind of indirectly references this, but I think another source (the Merc?) has reported that this will definitely be built as industrial space. So while it will bring new development, the buildings will probably be low-rise, with fairly low employee densities. Definitely good for San Jose, but not the kind of development or density that would justify something like a streetcar.